After an accident on a snowy bridge, Secret Service agent Mike Banning (Gerard Butler) makes the difficult choice to save President Asher (Aaron Eckhart), which left first lady, Margaret (Ashley Judd), along with the Secret Service agents in the front seat, to fall into the icy river below. President Asher and his son, Connor (Finley Jacobsen) did not want to have a daily reminder of Margaret’s death, so Banning was removed from presidential service, now working at the treasury. As tensions mount between North and South Korea, Speaker of the House Trumbull (Morgan Freeman) recommends an attack on the North. Secretary of Defense Ruth McMillan (Melissa Leo) and Vice President Charlie Rodriguez (Phil Austin) agree with the president that they should not start a war. As diplomats from South Korea are meeting with the president and his staff, a group of terrorists attack the White House. A rogue Air Force plane takes out the roof defenses and causes chaos, shooting innocent people on the streets of DC, allowing for a group of ground forces to storm the front door of the White House. The assailants succeed in killing every single Secret Service agent trying to protect the White House. President Asher is taken hostage, along with the Vice President and Secretary of Defense. The only high-ranking official who is safe is Speaker Trumbull. Banning, who saw something happening from the Treasury, runs to the White House. Acting on pure instinct and adrenaline, He must find Connor and make sure he gets out safely and then rescue the president and his staff. All while battling commandos roaming the halls. ***WARNING*** If you are planning on watching this movie, stop reading now. I am going to provide just about every spoiler you can imagine to save you from wasting 2 hours of your precious time. Although, if you start watching this movie, just about every one of these spoilers is easily predicted from the jump. If you are ever in doubt, it is always, always the retiring Secret Service agent, in this case, Forbes (Dylan McDermott), who is the bad guy. He’s got nothing to lose. And it never ends well. Kang (Rick Yune), who is introduced as a special agent for the South Korean diplomat is easily fingered as the mastermind. Banning, in true superhero Secret Service style, easily dispatches the well-trained commandos sent to hunt him down. He uses his knowledge of the secret passages to navigate his way around everyone. Miraculously, he is able to waste very few bullets as he shoots all the bad guys with his semi-automatic pistol while running and shooting behind his back. The well-trained commandos, with their fully automatic rifles with scopes cannot land one single hit on Banning. As expected, Banning finds Connor and sends him out a shaft in the basement. An anticlimactic rescue if I’ve ever seen one. Why would Banning not have replaced the grate over the opening after he sent Connor up? Instead, he leaves it open, as a beacon for the commandos as to where Connor may be. Worry not, though. Banning kills the lone terrorist who searches the basement with his bare hands. When Banning rescues the President, the President is shot in the kidney by Kang. Banning and Kang have a fist fight while the countdown timer for the destruction of all the nuclear weapons in their silos, causing the nuclear warheads to explode, which would cause America to become a wasteland. Nevermind that the warheads were never activated, so there would just be an explosion, at worst. Banning is able to put in the ridiculously long and complicated (what’s a hashtag?!?) override code in just as the countdown hits 3 seconds. Whew. At a later speech, President Asher, who was on death’s door in the bunker is able to stand and speak and walk, all with no issues. Meanwhile, the cut on Banning’s head, his sole injury, has yet to heal. There are no redeeming qualities to this movie. The story is completely implausible. How did it take that long to get the armed forces to the White House? How did the terrorists get an Air Force plane? Why was it not shot down earlier. Why were DC police at the scene instead of Special Forces? How is there not a better way to defend the most important building in the country? Why did the Secret Service men file out the front door single file into heavy gunfire? When Special Forces finally arrives in Blackhawk helicopters, why would they hang around as they summarily get shot down? I could go on. The scripting is terrible. The dialog is forced and contrived. They were trying to make it quotable. They made it ridiculous. Everything in this film looks fake. From the planes, to the falling flags, to, well, everything. Things look almost cartoony at times. Not something you expect from a film that appears to take itself so seriously. It’s like they spent their money on the cast instead of the special effects. Speaking of the cast, how can a movie so packed with big names fail so miserably? This is probably one of the worst movies that I have watched all the way through. Not even Morgan Freeman could save this movie. Do yourself a favor, if you want to see a movie about the White House being taken over, watch White House Down. It is a much better movie with a much better story. Aside from being a watchable movie, it is actually funny. 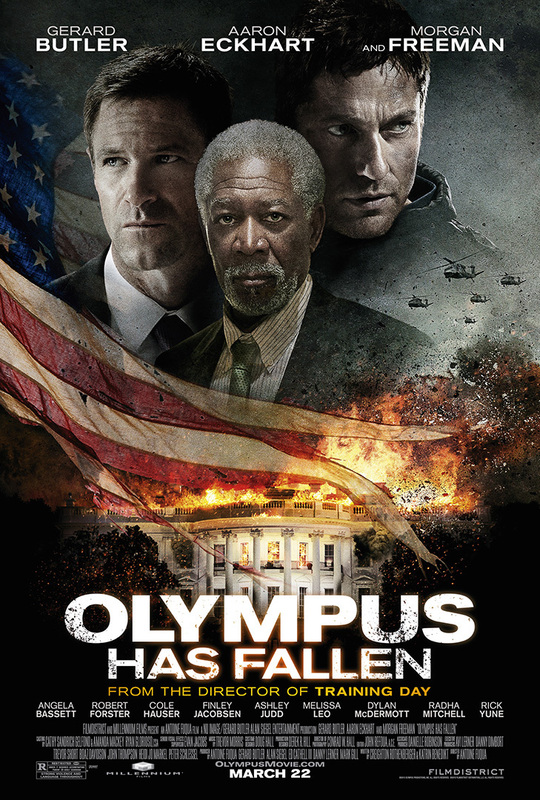 Whoever told me Olympus Has Fallen was a good movie, I would like a refund on my $1.30 from RedBox. The movie has fun action, and that’s what it’s meant for. Nothing more, nothing less. Solid review Bailey. I agree. I just wish it was a little better done. It was a little over the top with the way the effects were done.